Spoke Art Gallery is pleased to present 12 x 12 a group exhibition featuring over 60 local and international artists working in a 12 by 12 inch format. 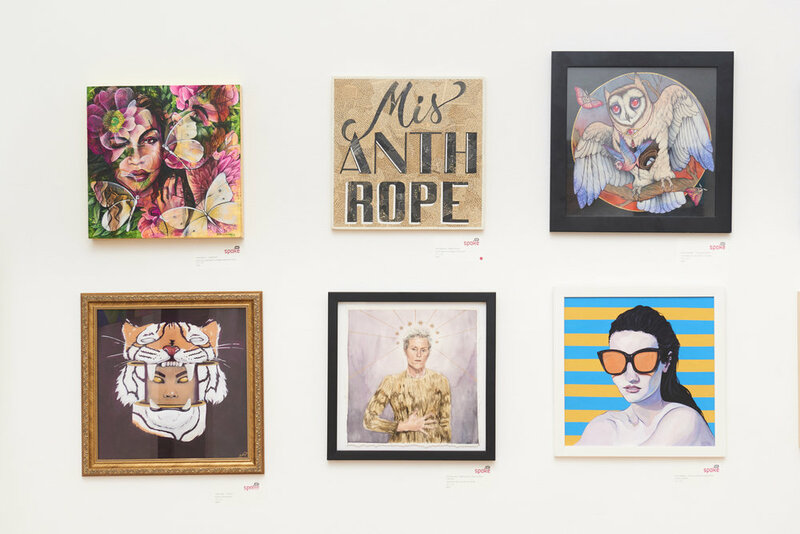 Participating artists include, Peter Adamyan, Seth Armstrong, Glenn Arthur, Bagger 43, Raul Barquet, Laura Berger, Jonathan Bergeron, Robert Bowen, Lauren Brevner, Leilani Bustamente, Adam Caldwell, David Choong Lee, Sam Wolfe Connelly, Deangus, Jason Edmiston, Ben Frost, Alex Garant, Ken Garduno, Serge Gay Jr., Abigail Goldman, Greg Gossel, Lauren Gregg, Caitlin Hackett, Happy D, Jessica Hess, Christine Aria Hostetler, Eliza Ivanova, Aaron Jasinski, Yumiko Kayukawa, Susannah Kelly, Caia Koopman, So Youn Lee, Adam Lister, Sergio Lopez, Amanda Lynn, Sean Mahan, Nimit Malavia, Ryan Malley, Jose Mertz, JP Neang, Jeany Ngo, Nicomi Nix Turner, Gage Opdenbrow, Karla Ortiz, Daryll Peirce, Rich Pellegrino, Neil Perry, Kevin Peterson, Mwanel Pierre-Louis, Ferris Plock, Dan Quintana, Carlos Ramirez, Allison Reimold, Ximena Rendon, Mike Shine, Jessica So Ren Tang, Amliv Sotomayor, Deth P Sun, Miranda Tacchia, Kelly Tunstall, Ricky Watts, and Casey Weldon. Spoke Art SF will host an opening reception on May 5th at 818 Sutter Street, San Francisco, CA 94109 from 6:00 to 9:00 pm.